Israel on defensive after embassy in Ireland posted: if Jesus and Mary were alive, they would probably be lynched in Bethlehem. The Foreign Ministry has launched a probe into the posting of a Facebook message by the Israel embassy in Ireland that said if Jesus and Mary were alive today in Bethlehem, they would probably be lynched by local Arabs. Ministry spokesman Yigal Palmor said, "We all agree that it was improper, inappropriate." He said Tuesday that it wasn't clear who posted the message. In its rush to apologize, the Foreign Ministry made no mention of the fact that the Palestinian Authority's Minister of Prisoners said in November that Jesus was "the first Palestinian and the first [Islamic] martyr in history." Similar statements have been made in the past by PA officials and propagandists. These statements carry clear a anti-Semitic message, blaming "the Jews" for killing Jesus, who was himself a Jew, as were his disciples, while mendaciously claiming that Jesus was a "Palestinian" millennia before the term even existed. No denunciations, by Israel or other countries, are known to have been issued, and the PA certainly made no apologies. The Foreign Ministry also did not mention the fact that Christians have been violently and sadistically persecuted in the PA, and that areas under PA control have seen massive emigration of Christians. 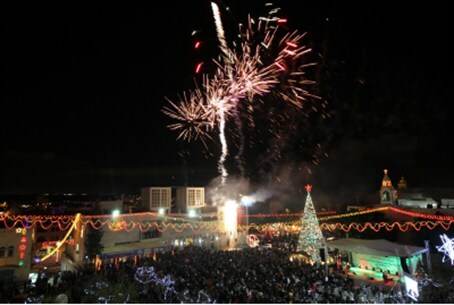 In Bethlehem, the Christian population reportedly went from a 60 percent majority in 1990 to a 40 percent minority in 2000, to about 15 percent of the city's total population in 2008.
International human rights lawyer Justus Reid Weiner, who teaches at Hebrew University, told the Jerusalem Institute for Global Jewish Affairs that, under the PA-Fatah regime, Christian Arabs have been victims of frequent human rights abuses by Muslims.